Articles listed most recent on top, oldest on bottom. Chord Combinations for the Lizard Ear, Cont'd From the Pros! Chord Combinations for the Lizard Ear. Another Dominant: Fresh Material for the V7 Chord. Something Old. Something New: New ways of looking at old scales. Part 2, Minor: Spelling out the Chords. Melodically. Part 1, Major: Spelling out the Chords. Melodically. 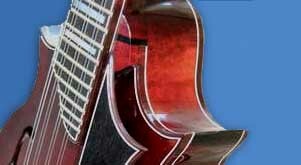 Closed Fingerings: A review on the benefits of closed finger patterns (FFcP). Lydian Tracks Pt. 2: A Path to Modal Improvising. Lydian Tracks Pt. 1: A Path to Modal Improvising. In the Mode: Easing into Modal Jazz. Fresh Comp'n Part 3: 'Swing Turnarounds'. Fresh Comp'n Part 2: 'ii V7'. Fresh Comp'n Part 1: Bottom of the (Minor) 9ths. Enhanced Pentatonics: What Goes Up Must Come Down. "Sweet" Chords: Fresh chord voicings and their context. Alternate Fingerings Part 2: Incorporating the Four Pentatonic Fingerings. 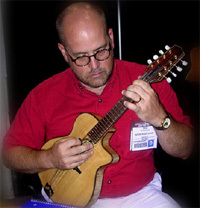 Alternate Fingerings Part 1: New ways to get around the fretboard. Developing Pentatonics for Jazz: A systematic approach to pentatonic mastery in all 12 keys. Thinking Good Tone Part 2: Using the picking hand to start Good Tone. Thinking Good Tone Part 1: What the Pros say about Good Tone. Linear Leanings: Another look at spicing up bland chord progressions. Chords in Passing: Exploring Diatonic Chord Progressions. Keeping in Suspense: A look at "Sus" chords and variations. Chord Melody: Scratching the Surface. Reharmonization Secrets Part 2: Taking more "harm" out of Reharm. Reharmonization Secrets Part 1: Taking the "harm" out of Reharm. Three Four Pull: Foregoing the Fourth Finger Frack. Suspicion of Melodic Intent: Principles of effective improvisation and the creation of melody. Chord Commonalties: m6, m7b5, rootless 9th. On the Up and Up: Jazz Articulations. Chicken "Nuggets": Afraid to improvise?...Don't be!